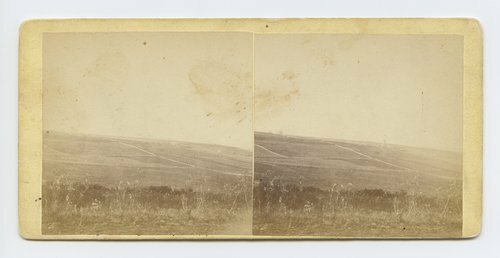 This stereograph shows farmland northwest of Mount Oread, Lawrence, Douglas County, Kansas. It is from Alexander Gardner's series, Across the Continent on the Union Pacific Railway, Eastern Division. View looking north west from Mount Oriad [i.e. Oread], Lawrence, Kansas. 323 miles west of St. Louis, Mo.